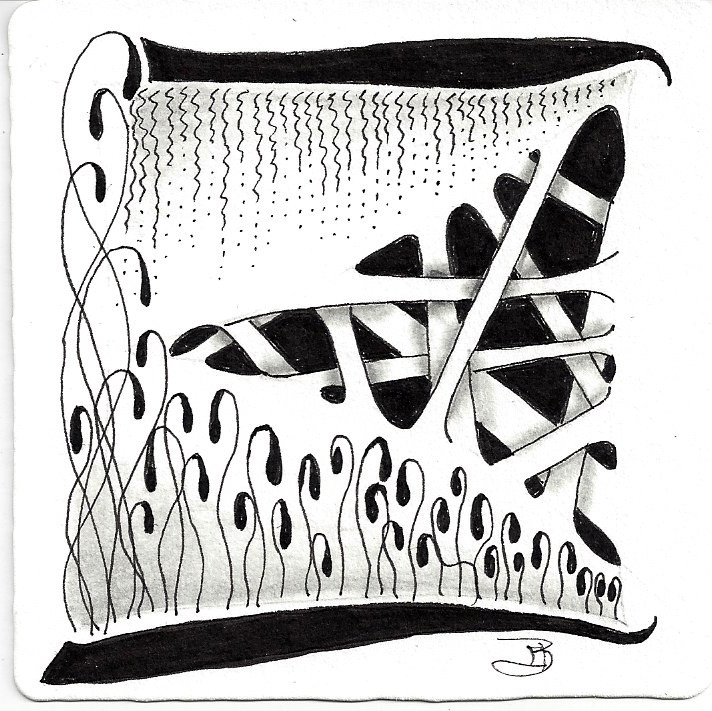 In response to the Diva’s challenge to go back to the old school (i.e., 3.5 x 3.5″ white tile, black micron 01 pen & Zentangle pencil), I decided to take a page from my own Basics class and work with the tangles we learn first. 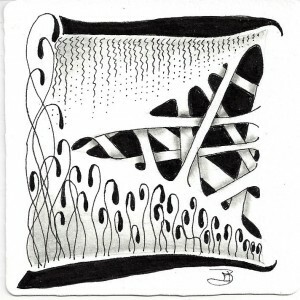 I’ve created several from the 7 tangles we learn in Basics, and this one is one of my favorites. My basics tangles are like old friends – comfortable, warm, easy – and it’s so natural with these old friends to slip into that Zen place of easy focus, joyous creation and fun. For those of you who have taken my Basics class, do you recognize these tangles? Hi Debbie – nice Tile and very tricky! Thanks for your comments. It was a fun tile! I love Hollibaugh when it is drawn as you did, sort of wrapping the bars around the area. Lovely tile. I do love the beginner tangles. I especially like the borderless Hollibaugh on this one. The beginning tangles feel like returning to your first love, don’t they. Thanks for your comments. This is great!! I love the black background in Hollibaugh corresponding with the black at the edges. I use Hollibough in my intro class, but I don’t think I would have thought to use the others. That is a very narrow view which you have remedied with this example. Great shading primer too. Love this. Your shading on the Hollibaugh is magic. So dimensional. Wow, I LOVE this tile; it’s elegant and has great contrast. Love the black in the background. It really anchors your nice composition. How wonderful, simple, open, inviting. The depth here is really good and they may be tangles you learn early but they are beautifully done. Almost like a breath of fresh air…so simple, so lovely. Thanks Sheila! I love returning to those basic tangles. Thanks! Hollibaugh was particularly fun. Wonderful tile with a great contrast! Great choice of tangles! Nice tile. I did a similar thing. I did not only use tangles that I teach in a Basic class. Like your Hollibaugh. Have used this in tiles but would be interested in how people in a basic class react to doing this version. So far they have been impressed with Hollibaugh, but I don’t know that they’ve tried it yet. Thanks for your comments. I love your tile…it’s so simple, yet so beautiful. The Hollibaugh is exquisitely done. Love the way you used it here. Thanks Lezli! I did have fun with Hollibaugh.